You may receive updates from Portland Jobs With Justice, the sponsor of this petition. Wells & Chase: Show Love this Valentine’s Day - Break Up with Private Prisons! Two of the private prison industry leaders, CoreCivic and GEO Group, depend on funding from banks like yours to conduct their day-to-day business operations, finance new facilities, and acquire smaller companies. A 2016 analysis of U.S. Securities and Exchange Commission (SEC) filings over the prior 10 years shows that Wells Fargo and JPMorgan Chase, among others, have played a large role in financing these debts. 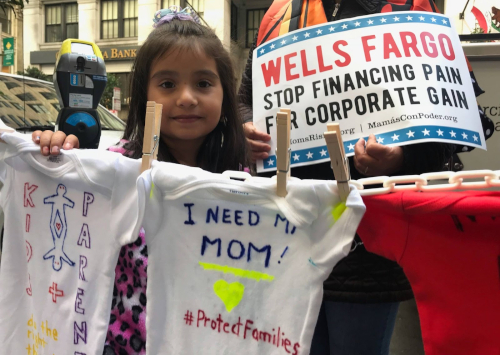 In doing so, Wells Fargo and JPMorgan Chase are profiting from mass incarceration and the criminalization of immigration. [3,4] We demand that you stop financing CoreCivic and GEO Group. It is inconsistent with your professed desire to respect human rights to continue to finance GEO Group and CoreCivic, the biggest operators of private prisons and immigrant detention centers. [1,2,3,4] Your customers and potential customers are not afraid to align our money with our values and urge you to as well. We pledge to, and/or will encourage others to, break up with Wells Fargo and JPMorgan Chase and switch to banks that actually respect our communities if this financing continues. #RealMoneyMoves.